We people at the hbz working on lobid.org used to think that the FRBR model covers the whole bibliographic universe, that it could be applied to all bibliographic resources in a library catalogue. Our work on mapping an converting legacy data to RDF has disabused us of the idea that FRBR applies to all bibliographic resources in a library catalog. The problem with FRBR and serials has been adressed several times in the last years and there has even been a proposal to adjust FRBR so that it also covers serials. We don't want to go too deep into this discussion here and just present our own analysis of the problem and our own approach for representing serials in RDF. See also Hans-Georg Beckers response to this article "FRBR, Serials and CRM". Starting to build lobid.organd creating the first data conversion from our library catalog export (excluding authority records) we typed all resources generally as frbr:Manifestation (using the FRBR core vocabulary created by Ian Davis). We had never heard about the serials problem and in discussions about FRBR had naively followed the notion that the records in a library catalogue all describe manifestations. Incompleteness of serials: Following FRBR, a manifestation is exemplified by an item. And this item can be hold by a library. There are no items of a serial which can be hold if there are still parts to be published. This conceptualization might still work with multi-volume manifestations like a encyclopedia in 26 volumes because you can have an "item" of this as it is complete. But it doesn't work with incomplete journals or other serials. Heterogenity of manifestations comprised by a series: The parts of a book series can themselves be manifestations or expressions embodied in different manifestations, e.g. if a book in a series gets re-printed or revised. To get a picture of the problem we analyzed what actually is described in a library cataloue (again, excluding authority data). Going out from traditional cataloging practice we tried to come up with a simple overview of what kinds of things are actually catalogued. Intentionally, we took a fresh start without taking FRBR or anything else into account. So, what is catalogued? What are catalog records about? What is recorded? We spotted three different kinds of things. First, we have concrete items someone my obtain and read, like an exemplar of a monograph, a journal issue or a journal article. Items can have identifiers like call numbers. This category is analog to FRBR item. Second, we have what you can call types. This is like the type or model of a car which can be technically described but you can't drive it - as you only drive in a concrete car which exemplifies the model. Thus, types are sets of copies and these are especially described in bibliographic databases without information on exemplars like holding information. A monograph, a journal issue or a journal article can all be described on type level. This category is analog to a FRBR manifestation. Third, we have have sets of types which, thus, are sets of sets of copies. We can't find any analogy in FRBR here. Why aren't journals works or expressions? You might say: "Hey, we have something in FRBR which are sets of sets: Expression and Work! Consequently, serials should be typed as works or expressions." We won't do that. Why? First, because we think these classes are quite unclear and don't take into account traditional cataloguing practice enough, thus making the migration to a new data model even more difficult. Second, and more important in this context: A work or expression comprises manifestations which are related to or derived by each other, e.g. by being version of another (in case of revised editions) or by being translations of another etc. In the case of a series, the only relation between the different manifastations of the series is them being published in the same series – no derivative relations to be found. As the relations between parts of a serial thus substantially differ from the relations expressions and manifestations are based on, it doesn't seem sensible to us to comprise serials under these FRBR classes. In lobid.org we only use the FRBR classes item and manifestation as they make direct sense building on traditional cataloguing practice. We apply the frbr:Manifestation type to monographs, DVDs and similar instances as well as to multi-volume works as a whole. Typed as frbr:Item are exemplars of single- and multi-wolume works held by libraries. 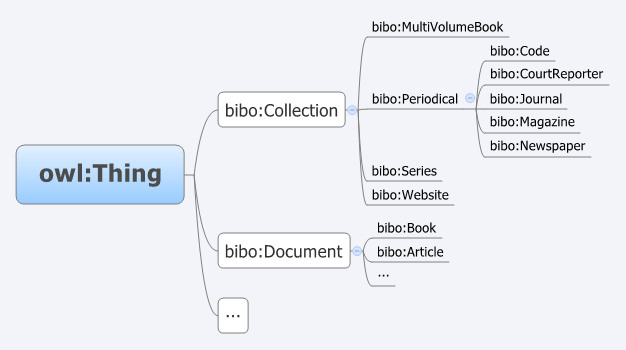 Regarding serials, we fall back on the Bibliographic Ontology (BIBO) and use subclasses of bibo:Periodical and bibo:Series (see an overview of these BIBO classes here). This seems to go together well with the notion that journal issues are FRBR manifestations and concrete issues held by a library are FRBR items. As the held issues as well as the items have no URI (yet), the result contains two blank nodes. As soon as there are URIs for issues and exemplars we can add these. We are happy about feedback.